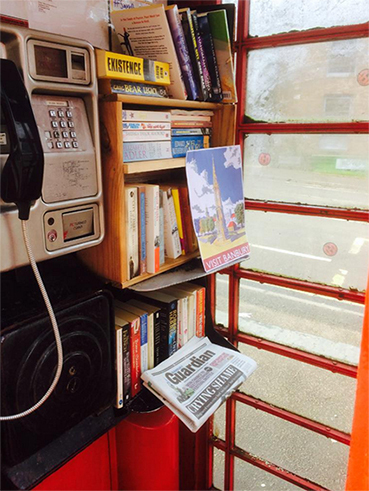 Save Banbury’s Phone Box Library! Who’d have thought that a small but effective local community initiative in an Oxfordshire town would attract such global attention? The Banbury Phone Box Library is one such brilliant piece of local engagement which is now garnering international attention as BT looks towards chopping it off at the knees. The red phone box is almost as iconic as the red bus as a national symbol of Britain around the world. You’d think if you were company who owns and operates these highly visible pieces of cultural capital you’d be only too pleased to see them being involved in well supported local campaigns that add value to a service that is perhaps not as loved as it once was. In that context it seems daft to me that BT are hell bent on annoying small and large communities across the country by removing public call boxes where they’re valued for numerous reasons other than a quick natter on the phone. It’s even more self-defeating that they’re erasing some of the very symbols of Britishness that have helped them build a world class multi-national company. It has to be said that the Town Council in Banbury share some of the potential blame if the box is removed, as they are refusing to adopt it (something that BT now allow for the princely sum of £1), if BT go ahead with plans to decommission the phone service in the box. Previously they struck a deal with BT to adopt the box and save the library and a local steel fabrication firm offered to fix permanent shelves in the box to house the books to assuage BT’s prior objections to the library service on health and safety grounds, as they believed the current shelving arrangements could be dangerous. BT now claims that it is uneconomic for them to continue to run the service anyway, even though I understand thousands of calls were made from it last year. The under-story seems to be that BT want out of the call box game at any cost, and most of that cost will be borne by local communities using the boxes for a number of vital social services or simply to make a call when other options are not available to them. Banbury Town Council now say that they’re not prepared to adopt the box if it is then decommissioned by BT. Whilst I support taking a stance against the loss of the phone service, I think it would be a sad loss to the community of the box were to be removed as a result of the Town Council refusing to adopt the box itself. Moreover, If BT are claiming the box is loss making, I think it would be useful for them to provide the figures backing that up. It would at least give us an idea of the likely shortfall which could perhaps be covered in some other way. It’s also crazy that BT are missing this as an opportunity for some very positive PR. It has to be said that they’re not universally loved as a company, so something like this, that is fairly minimal in cost terms, would seem to be a great way for them to connect with the community. Going forward perhaps the government needs to bring in a legal requirement on telecoms companies like this to provide a certain number of public call points in an area. Just because most of us carry mobiles now, doesn’t mean that sometimes they might not fail at a vital time, or have been forgotten when they’re most needed. I know BT used to be obliged to seek permission from local or parish councils in order to remove a box, but it sounds like that requirement has now been watered down. In very rural areas mobile phone reception is also notoriously patchy. In those areas call boxes provide a vital service for emergency calls. In terms of usage statistics, it might also be interesting to track the number of calls made against the minimum price of a call in a phone box, which I understand is now 60p. Perhaps BT need to be reminded of the law of supply and demand. The K 8 model telephone box is a very important part of the British identity and would love to see more of these models saved and refurbded in to an operational unit again instead of becoming green houses in back gardens. They are a real icon. Anything that keeps them on the streets it OK by me!